Elisha Smith, William “Bill” Titus, Jr., Barbara Sexton Smith, Mary “Katie” Telek, Krista Riley, Lauren Niemann, D’Angelina McMillan, Amosi Bilombele, and Ella Robinson received awards. Antonio Wickliffe, Jill Harmer, Charlie Casper, Christine Perlin and Kay Tillow spoke about single payer health care with the participants in the hour before the awards ceremony began. Mary Downing, who stopped by the KSPH table, volunteered to march for single payer even though she said she would have to use a wheel chair. She said that she is an activist from the 60’s and knows how important it is to demonstrate for what you believe in. 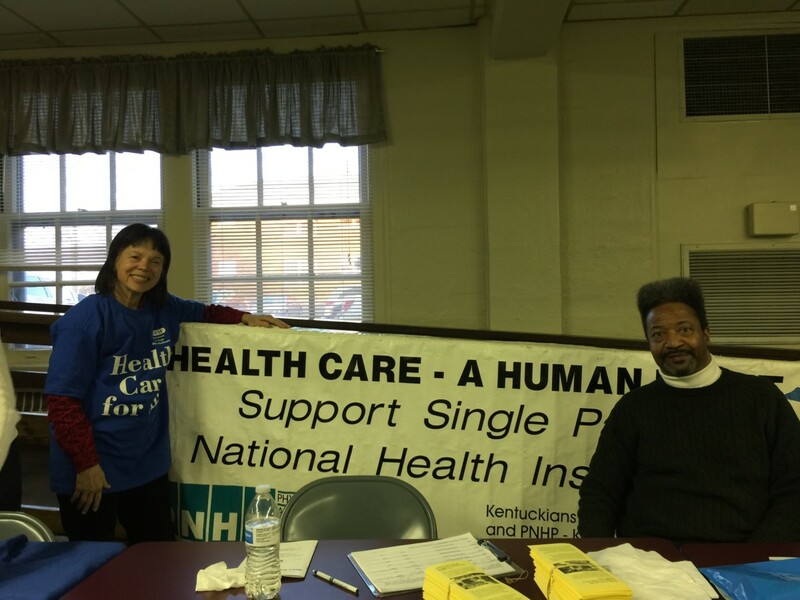 Antonio Wickliffe, a member of MDC and a member of the KSPH Steering Committee, organized the single payer participation.